For its stunning new headquarters building in Dubai, major investment conglomerate Dubai Holding has created an exemplary office building which is prioritising health and wellbeing in its design and operations. As part of the design the creation of workspaces, which help promote collaboration, communication and wellness, led to the specification of a number of partitioning systems from Optima. The prestigious, government-owned building in the Umm Suqeim district of Dubai features a workplace which puts sustainability, wellbeing and the agility of the workforce front and centre. 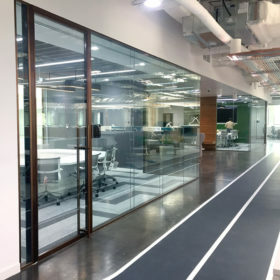 The use of full-height glass partitioning was integral to striking the right balance between the open plan layout and enclosed quieter areas, as well as offer unrivalled acoustic control between these spaces. Optima provided a range of products including its Revolution 100 and Revolution 54 glazing systems to meet the designer’s brief for exceptional aesthetics and outstanding acoustic ratings. Vertical gardens or living green walls brought further visual impact to the offices and will further enhance the wellbeing of staff and visitors. Now complete, Optima’s glazed partitioning has helped deliver on the client’s brief for an inspiring workplace environment that positively influences health and wellness.